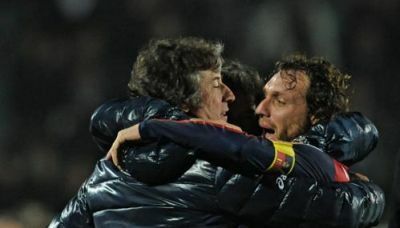 After the defeats against Cesena and Milan the match in Siena was very important to coach Alberto Malesani and the team. The first half was very nervous to both teams who had fear to take a goal. At the beginning of the second half our captain Marco Rossi scored the opening-goal after an error of the Siena goalkeeper. A few minutes later it seemed that our rented striker Mattia Destro should score the equalizer, but before an almost empty goal he hit the crossbar. After Genoa had missed several chances to decide the match it was finally Rodrigo Palacio who scored 0-2 in injury-time. Genoa now is 7th in the standings with 18 points in 13 matches. Tuesday we play the cancelled match at 6th November because of the flood against Inter. Genoa did win the important match against A.S. Roma with 2-1 by a goal of Bosko Jankovic in the 37th minute and Juraj Kucka in the 89th minute. Best player of Genoa was goalkeeper Frey. Genoa is now 8th in the standings with 12 points in 8 matches. Roma played as we did in the Gasperini-period: very offensively with at the end 4 strikers. The ball-possession of the Romans was 68%, but the defense of Genoa with their leader Sebastien Frey stopped everything. Eight minutes before the end of the first half Rodrigo Palacio ran with the ball towards the goal of Maarten Stekelenburg. Inside the penaltyarea our topscorer played the ball to Bosko Jankovic who shot it strongly in the far corner: 1-0. In the 2nd half Roma played even more offensive and after a mistake of both Merkel and Bovo the Romans scored 8 minutes before the end the equalizer. Still a good result to Genoa, but our players wanted more. In the 89th minute Genoa got a corner which Veloso shot a little too hard, but Merkel headed it from the backline besides the goal against the legs of Juraj Kucka into the goal: 2-1, game over ! Next Sunday we play in Florence against Fiorentina, the former team of Rossi, Dainelli, Moretti and Frey, while their star-player Gilardino was close to a transfer to Genoa last summer. Strange enough after only 1 point in the last 3 matches and a visit in the new Juventus Stadium against nr. 1 in the standings every Genoano had faith in a good result before the match. Mr. Malesani started with Mesto, Moretti and Merkel in the line-up against the hometeam that started furious and leaded with 1-0 after only 5 minutes. This was the time to Genoa to fight themselves back in the match which succeeded and brought us the equalizer of Marco Rossi who played his 200th Serie A match this night. The first half ended with 1-1 on the scoreboard. The 2nd half started like the first episode with a powerfull Juventus. Again Matri opened the score, but from that moment Genoa was the best team in the field. Many changes were missed, Merkel headed the ball on the crossbar, but in the 85th minute the reward came with the first goal of the season of Andrea Caracciolo: 2-2. The rest of the match lasted 11 long minutes to Juventus that was very happy when referee Romeo ended the match and the draw was official. Wednesday we play in Luigi Ferraris against Roma and we have to show that the match in Torino was more than an incident. Of course we all wanted Genoa to win the first homematch of the season, but afterwards we can say that the 2-2 draw was the most honest result. After only 6 minutes Miguel Veloso scored the first goal of the season after an assist of Palacio. The joy lasted only 2 minutes when Moralez scored the equalizer: 1-1. Our best player Rodrigo Palacio was close to 2-1, but the goal was made just before halftime at the other side: again Moralez: 1-2. Ten minutes after the break Giandomenico Mesto scored the equalizer after a big mistake in the Atalanta-defense. During the rest of the match both teams had chances to score the winning goal and in the last minute our new playmaker Valter Birsa got a red card, but the score did not change any more: 2-2. Genoa beats Cesena by 3-2; Sampdoria R.I.P. 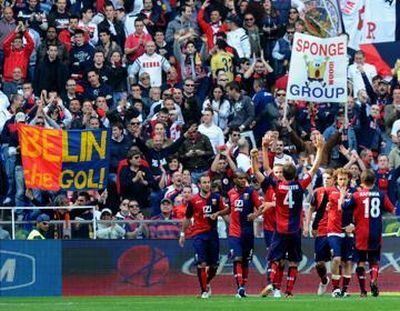 In the last match of the season Genoa beat Cesena by 3-2. At halftime the score was 3-0 by goals of Floro Flores (2x) and Rodrigo Palacio. Genoa ended the season at the 10th position with 51 points. The mission of reaching the left side of the standings succeeded. Again a victory in the derby, the 5th in the last 6 editions! The goals of Genoa were scored by Floro Flores in the last minute of the first half and his substitute Mauro Boselli in the last second of the 2nd half. Sampdoria is now close to relegation to Serie B which seems the only escape of many more defeats in the derby the next years. A derby always starts immediately after the last match before the 2 Genovese clubs play against each other. This time Sampdoria was most of all in the spotlights because the club is in big danger to relegate to Serie B. Because of this the team already went on Thursday for a trainingscamp to Novi Ligure to prepare in silence. After protest of the supporters they got the opportunity to visit the team on Saturday in Novi Ligure. When the Samp-supporters arrived in the mountains around 50 kilometers of Genova they found a red and blue painted trainingsfield with many times “Serie B” on the walls around the complex. 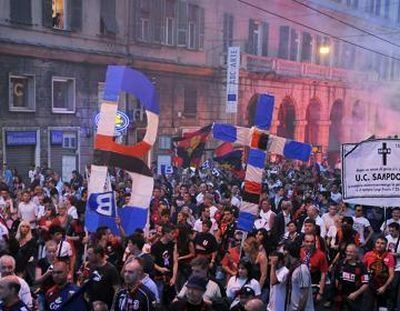 Even worse to Sampdoria is the fact that the derby for the first time was not sold out because Samp sold only 8.700 of their 11.000 tickets. With Genoa this never happened in the history and we also had many years at the bottom of standings, even in the years in Serie B. In the first half Genoa played a little better then Sampdoria and the reward arived in the last minute: a corner of Milanetto was headed by our Genoano of the year Rodrigo Palacio towards Antonio Floro Flores who beat Sampdoria-goalkeeper Da Costa. 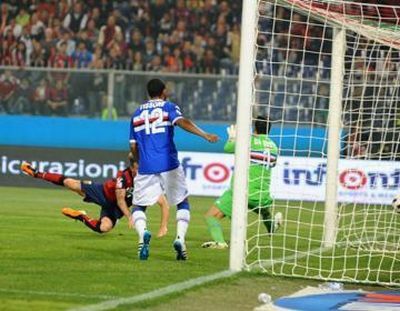 In the second half Genoa played worse and gave Sampdoria the chance to come back in the match. After Eduardo coulden’t get control of a shot of palombo it was Pozzi who scored the equalizer: 1-1. It looked like the match would end with this draw, which was very disappointing to the Genoa-fans, but after 96 minutes and 13 seconds it was Mauro Boselli who scored the winning goal, just 17 seconds before the end. Referee Tagliavento immediately ended the match, there wasn’t even time to do the kick-off. 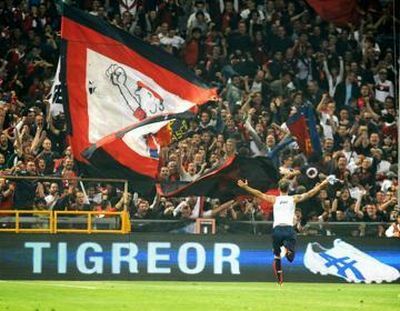 Genoa now did win 5 of the 6 last derby’s, which was impossible to think about a few years ago. Just before the end of the match Marek Hamsik brought Napoli a 1-0 victory against our team that played with 3 Primavera-players (Polenta, Jelenic and Destro). A draw would be the most honest result, but our friends of Napoli needed a victory and after the defeat of Lecce yesterday in Verona we are sure of remaining in Serie A next year. Next Sunday at 20.45 hours Genoa plays the homederby against Sampdoria, that struggles against relegation to Serie B. Genoa still is 10th in the standings. Genoa has beaten Lecce by 4-2 with 2 goals of both Floro Flores and Rodrigo Palacio. Genoa is now 10th in the standings and 99% sure of being in Serie A also next season. After only 3 minutes Davide di Michele opened the score, but the joy of Lecce lasted only 7 minutes when Antonio Floro Flores scored the equalizer. Again Di Michele gave Lecce a new advantage, but just before halftime Rodrigo Palacio scored the equalizer: 2-2 at halftime. In the second half Palacio (with a header!) and Floro Flores both scored their second goal and gave us a 4-2 victory and a position on the left side of the standings. 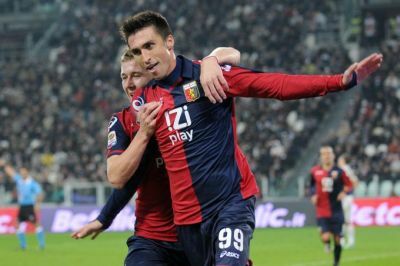 The victory arrived and Genoa is now 10 points ahead of the relegation-zone. Number 18 Sampdoria (!) has 32 points and has only 5 matches to try to stay in Serie A. The goals of Genoa today were scored by Rafinha and Antonelli, while Berardi scored in his own goal. Genoa is now 11th in the standings and has to climb at last 1 position to reach the misson of this season: ending inbetween the first 10 teams in the standings.